Snake chain lenght 40,0 cm with karabiner lock, a very light pleasant wearing silver necklace for the women. The snake chain was made from solid 925 sterling silver - silver wire in a special technique produced, therefore from the weight very easily. The surface is highly polished, very light pleasant wearing silver necklace for the women. Snake chain lenght 45,0 cm with karabiner lock, a very light pleasant wearing silver necklace for the women. Snake chain lenght 50,0 cm with karabiner lock, a very light pleasant wearing silver necklace for the women. Snake chain lenght 55,0 cm with karabiner lock, a very light pleasant wearing silver necklace for the women. Snake chain lenght 60,0 cm with karabiner lock, a very light pleasant wearing silver necklace for the women. Snake chain lenght 65,0 cm with karabiner lock, a very light pleasant wearing silver necklace for the women. Snake chain lenght 70,0 cm with karabiner lock, a very light pleasant wearing silver necklace for the women. 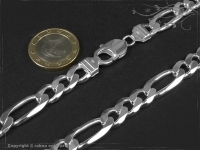 Snake chain lenght 75,0 cm with karabiner lock, a very light pleasant wearing silver necklace for the women. Snake chain lenght 80,0 cm with karabiner lock, a very light pleasant wearing silver necklace for the women. Snake chain lenght 85,0 cm with karabiner lock, a very light pleasant wearing silver necklace for the women. Snake chain lenght 90,0 cm with karabiner lock, a very light pleasant wearing silver necklace for the women.